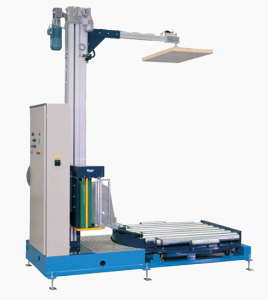 Automatic Stretch Wrapping | PAK Automation Ltd. The logical progression in an automated packing and palletising system, stretch wrapping secures pallets in an economical and stable manner for safe transportation. This specially developed technique acts much like a rubber band. A stretch wrapper stretches the film up to several hundred percent before it is applied onto the pallet. The pre-stretching of the film makes it thinner but also stronger, and every time the pallets under transport get jolted, the film contracts and stabilises the load further. Transport Safety – pallets are secure and product load can’t shift or spill. Added Security – prohibits load tampering and pilfering. Weather Protection – plastic wrap keeps away dust and moisture. The GL 1000 is an automatic pallet stretch wrapper with a powered conveyor. Fulfilling the highest demands regarding capacity, adaptability, easy maintenance and economical operation, it is the ideal fully automatic wrapping station for your packaging line. The GL 1000 is equipped with a unit that pre stretches the wrapping film. 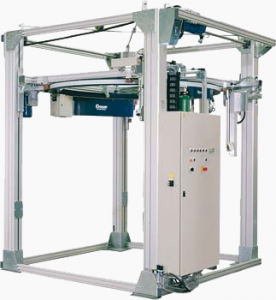 With a programmable operating system, variables like the turn-and-lift speed, amount of film, and wrap tension can all be adjusted to handle a large variety of loads to meet your individual requirements. The GL 1000 is delivered programmed to suit your operational needs and the entire station is operated from a single operating panel, saving space and improving safety. 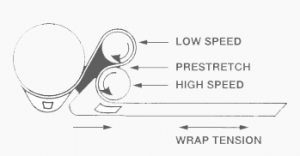 The stretch wrapper can be designed for larger loads. The GL 2000 has been developed to meet ever tougher demands from industry. Incredibly fast and flexible, it can handle varying load sizes, including part pallet loads, variations in automated storage, different film tensions based on the chosen programme and configuration. Four pre-programmed wrapping configurations for different types of goods can be chosen, either manually from the operating panel or by remote control. Individual settings for every programme can easily be made via the display unit. No previous knowledge of programming or special equipment is required. It is easy to calculate the cost of the film, as the amount used for each pallet application is shown on the display. The machine has a unique battery-powered film unit which means that the ring does not have a rotating power-feed, this feature makes the system practically maintenance-free. Recharging always takes place when the ring is at a standstill.